Here is what happens when the director of community service is set loose with a county credit card. She spends the money and fabricates $2,000 worth of FEDX receipts. Hmm. What did she buy at Fed X… or rather, what did she really buy with the $2,000. A Knox County jury found Cynthia Finch guilty of 2 counts of forgery Wednesday afternoon after four hours of deliberations. The former Knox County Community Services Director was accused of falsifying receipts for purchases made on her county credit card, known as a P-card. Prosecutors also charged Finch with fabricating evidence, a allegation jurors found Finch not guilty of. Tuesday, in testimony not heard by jurors, Finch’s former executive assistant, Requitta Bone told the court Finch would write county functions as explanations for charges that were associated with a sorority. Bone’s testimony was off court record and ultimately, she was never called by prosecutors to speak in front of jurors. Wednesday, prosecutors downplayed Bone’s significance as it related to their case in the fabricating evidence claim. Finch faces a maximum of 8 years behind bars according to state statute for level D and level E felonies. The judge will likely sentence her in March. The former Knox County Community Services Director has no criminal history. It is possible she will not receive jail time and could be offered diversion, that decision is up to judge Jon Kerry Blackwood. “He could decide to impose some term of incarceration, he also could impose probation, he also has something available to him calling pretrial diversion so there’s a whole range of things that could happen,” Mike Meyer, a prosecutor from the Tennessee District Attorney General’s office said. Neither of the prosecutors said they could comment on what sentence they would ask the judge to impose on Finch. Shortly after the verdict was read, Finch left the courtroom with several supporters and one of her attorneys at her side. She walked quietly as reporters asked her questions, other than to say, “God is good, God is good” before entering an elevator. A pair of Knox County Commissioners in 2007, Paul Pinkston and Lee Tramel played significant roles in initiating the purchasing card audit that ultimately led to the charges Finch faced and was convicted of. Pinkston spent hours digging through financial records and ultimately was the one who brought many of the concerns to the public and commission. Wednesday afternoon, Pinkston said it was somewhat vindicating to see justice and something come of the case but he would not go so far as to say he felt jail time was appropriate for Finch. Lee Tramel was another commissioner who played a big role as the commissioner who suggested they instruct the Knox County Auditor to conduct the p-card audit. Both men say they don’t think Finch was the only one that abused the system but Tramel says while others paid back any misguided expenses, Finch chose not to. Still, it’s hard for either to consider the convictions a “win” for taxpayers, the county, or anyone involved. “You know it’s not a victory, you know, by any stretch for Knox County or anyone else. Nobody wants to see anybody go through this. Things happened that were wrong and I think now we know exactly what happened and what has been done and it was just as was reported by the County Auditor,” Tramel said. The case against Cynthia Finch, Knox County’s former Community Services Director is now in the hands of a jury. Prosecutors wrapped up their case mid-day Tuesday with UPS Store manager, Nathan Mishu. Mishu testified that Finch came into his store and asked if there was anything he could do to help her get some receipts from Kinko’s. He said the only thing he could do was take the logo off their website and tape it to the top of UPS Store invoices. The defense team then grilled Mishu about exact dates and the timeline of everything that happened. Mishu started to contradict some of his statements regarding the exact date Finch visited his store when questioned by Bob Jolley, Finch’s defense attorney. Mishu said he couldn’t pinpoint the date but remembered Finch coming in and then faxing copies of the doctored receipts to a ‘215’ fax number that fits Knox County’s City/County Building. The biggest confrontation of the day came as prosecutors tried to call Requitta Bone, a former mayor’s office staffer and Finch’s executive assistant to the stand. Jolley argued Bone should not be allowed to testify as many of the documents she would speak to were not included clearly in evidence before the trial. Prosecutors denied that charge and insisted her testimony was relevant. Ultimately, Judge John Blackwood told the attorneys to bring Bone in to testify with the jury outside the room. He would then hear what she had to say and would determine it’s relevance in the case. Bone testified with no jury in the room that she would run errands of sorts for Finch, shipping and purchasing things with the county purchasing card both for county business and their sorority. For whatever reason, prosecutors chose not to call Bone to the stand in front of a jury. They told 10News “we simply didn’t call her”. During her testimony Tuesday, Bone presented Judge Blackwood with a copy of a receipt the former assistant said was associated with t-shirts for Finch’s sister’s organization, TennCorp. The receipt had a handwritten note allegedly from Finch that described a t-shirt purchase was for a “senior summit”, an explanation of a county function that would justify the purchase. However, the same document in the case file, gathered from the auditor does not have the handwriting on it. It is believed the handwritten note came after the document was submitted to the county. Bone resigned from county government following her own troubles with p-cards, including a trip to Disney World paid for with the card. Additionally, several Finch supporters served as character witnesses, testifying Finch is an honest, hard-working, and trustworthy member of the community. The jury is expected back in the courtroom tomorrow morning and will then retreat to a private room to begin their deliberations. Facing a trio of counts and possibly jail time, Cynthia Finch’s defense team pulled out a case arguing everything from race to a spat between the Knox County Auditor and Mayor’s Office are to blame for her legal situation. Prosecutors meanwhile are relying on a dozen forged receipts from FedEx-Kinko’s that someone turned into auditors bearing Finch’s signature. The trial for former Knox County Community Services Director, Finch, started Monday in Knox County Criminal Court. In the midst of a 2007 audit of county purchasing cards, Finch is accused of making up receipts and turning in about $2200 worth of false purchases. Attorneys for both sides gave opening statements after a jury selection that lasted about two hours. 8 women and 4 men will serve on the board that ultimately will determine if Finch is guilty. For the first time, Finch’s side of the story came to light inside a Knox County courtroom. Her defense team argued she was singled out in part because of race and in part because of a spat between the County Mayor’s office and Knox County Auditor Richard Walls. The state called Walls to the stand as its first witness. The auditor testified that there was something that just didn’t seem right about the receipts Finch turned in detailing the purchases made at FedEx-Kinko’s (now FedEx Office). 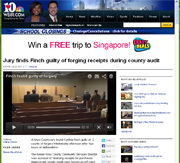 Finch’s defense team pushed to prove the chain of custody was shoddy at best when it came to who controlled the documents that made up the audit. “But you don’t know who brought you the receipts, do you?” Jolley asked. “No sir, I don’t know who delivered it,” Walls testified. A district manager for the office store testified she could tell right away the invoices turned in as receipts were not standard issue from the company. The logo on the hard copy paper wasn’t consistent with what the company used. “Anytime we use that beacon it’s on top, between the ‘o’ and the ‘s’ (in ‘Kinko’s’). It appears to be off our website,” Cindy Katlin, of FedEx Office said. Katlin testified 12 invoices turned in as proof of purchases bearing Finch’s name were likely fake. Jolley continuously asked witnesses if there was anyway to prove that Finch abused her county purchasing card by buying items that were for personal use. None of the witnesses could provide evidence she did so. Jolley has previously told the courtroom that Knox County declining to seek damages against Finch should serve as further proof Finch did not commit fraud. Finch’s trial is expected to last at least until Tuesday afternoon and likely will go into Wednesday. Tuesday, an employee who dealt first hand with creating the false receipts at FedEx-Kinko’s is expected to testify. Former Mayor’s office staffer Requitta Bone is also expected to testify at some point during Finch’s trial. The jury has been seated for the forgery trial of Knox County’s former Community Service’s Director, Cynthia Fincn, and opening statements have begun. The jury consists of 4 men and 8 women, but none of them are African American. There were 38 jurors called for this case, and only one of them was African American. That woman was dismissed because she belonged to the same sorority as Finch. The jurors were questioned about their personal credit card use, whether they kept receipts for their purchases, and whether they belonged to a fraternity or sorority. They were also asked about their familiarity with purchasing cards and the audit process. “Ms. Finch is different from us, isn’t she? That’s right. She’s black,” said Jolley. Jolley also pointed out that Finch was a high-ranking black official and because of that, she shouldn’t have been singled out and shouldn’t be facing these charges. Knox County’s Former Community Services Director Cynthia Finch will face a jury of twelve as she stands trial accused of forging receipts in the midst of a county audit into purchasing cards. Jury selection began Monday morning. There are thirty-eight potential jurors. The judge denied the defense’s second motion for a continuance. They wanted more time now that Requitta Bone was added to the witness list. Requitta Bone was Finch’s assistant. Finch faces two counts of forgery and one count of fabricating evidence. She is accused of falsely reporting more than $2,000 worth of purchases from FedEx/Kinkos.